Our company Progress LTD is acknowledged among industry leaders of the manufacturing and installation of metal lattice structures in Ukraine. 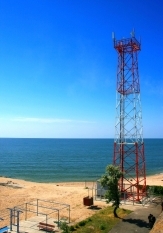 Since 2009 we have grown as one of the leading Ukrainian telecommunication mast, towers and met masts manufacturers. 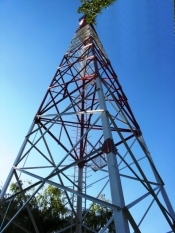 We provide design, manufacture, supply, full installation, maintenance services, dismantle of metal constructions (such as met masts, masts and towers for antennas, etc). Different steel constructions (according to Customer’s drawings). 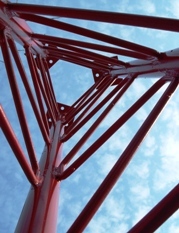 Lattice masts and towers are great strength, low weight, wind resistance and low cost constructions. 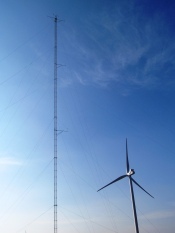 Our masts and towers are fabricate using high quality equipment and are suited to meet a variety of needs. They can be custom designed to suit any height requirements. Our constructions are used as met masts (measuring mast) or masts for telecommunication needs (mounting aerials or wi-fi instruments). Our mast sections are two meters high that allow an easy transportation and mounting. Most of our constructions can be located both on the ground or on the top of buildings. Met mast installation process include delivery, installation on site, guy installation and mast straightening. We have a skilled experienced team of mast, towers and equipment installers who are competent and trained regarding to Ukrainian applicable requirements. Mast installing also include guy ropes testing with a calibrated tensionmeter to prevent mast overloading or excessive movement. Met mast can be built as high as required. Lattice structure reduces uncertainty in wind measuring data and also is climbable. Because of rope wires mast can tolerate high wind loads which are very important for installation in wind areas. 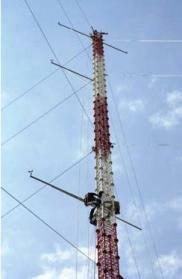 Working life of met mast is around 20 years according to CM drawings. 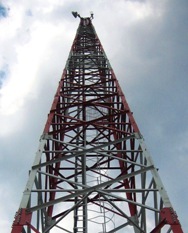 - Triangular mast (base 1000mm). Total height is up to 150m. 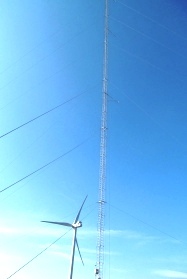 All met masts have high wind loading capabilities and icing capabilities. Measuring masts can be supplied with mounting brackets for associated instrumentation. These constructions are used for carry dish reflectors or aerials-antennas. Guyed constructions is the most cost effective solution for telecommunication or wind monitoring needs because they weight less then half the weight of towers. They can be triangular or square in plan. Antenna surface area is up to 10 m2. All masts have high wind loading and icing capabilities. These free standing constructions are typically used where usable ground area are limited, because they need less installation area than masts. And also they can tolerate higher payloads than guyed masts. 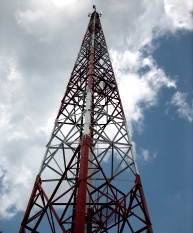 In every tower there are platforms at different levels for antennas mounting. Antenna surface area is 18 m2. The most popular tower is 76 m construction allowing making towers 30m, 40m, 50m, 60m, 70m by means of the demolition of the lower section. There are also other towers (high up to 18m and up to 26m) for installation on the top of buildings.